Bills fans have rallied behind Ezra Castro before. So when the man better known as "Pancho Billa" let it known he was heading back to the hospital, supporters let him know they were rallying for him again. Castro underwent a CT scan Friday to check on the status of his cancer, which was first diagnosed in the fall of 2017. He said on his Twitter account that he was being admitted to the hospital because the scan "showed something in my lungs" that doctors "didn't like." As of Saturday night the tweet had more than 400 replies. Castro, a lifelong Bills fan and president of the Dallas-Forth Worth Bills Backers club, was named the inaugural member of the Buffalo Fan Wall of Fame in November. Despite his chemo treatment last season, he made appearances at training camp and the home opener. 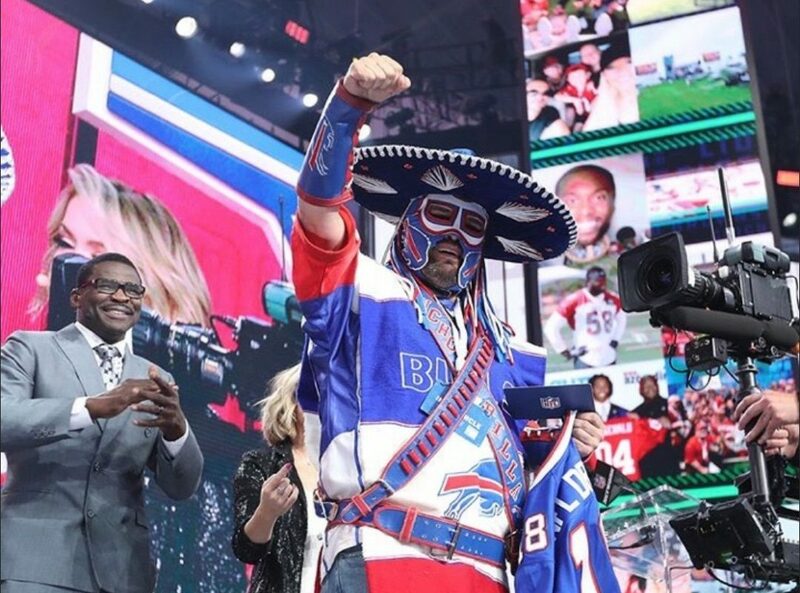 And before that, Pancho Billa was brought on stage at the 2018 NFL Draft. Saturday night, former Bill Stevie Johnson volunteered his announcing of this year's third pick to Castro. #PanchoPower continues to be strong. Safeties have become a top priority in recent years: Eight safeties have been chosen in the first round over the last three drafts, Jay Skurski wrote in the latest of our position-by-position NFL Draft preview that focuses on the safeties. Safety is pretty far down on Buffalo's needs heading into the draft, but that didn't stop the Bills from bringing in Florida’s Chauncey Gardner-Johnson and Virginia’s Juan Thornhill for pre-draft visits. Will the Bills will stay put at No. 9? : Skurski says it's looking like 50-50. His latest NFL mailbag included that question and plenty of other draft-related inquiries... as well as an unavoidable GoT question.